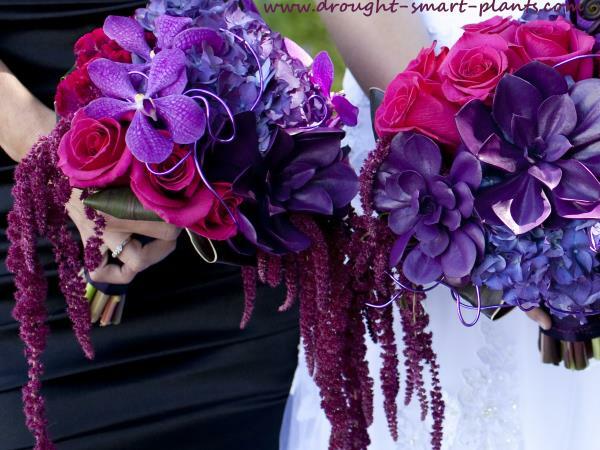 Succulent Wedding - are you ready for yours? Your succulent wedding is the most exciting thing ever – but what if you can’t find the succulents in the right colour, in time for your big day? Here’s an easy fix. 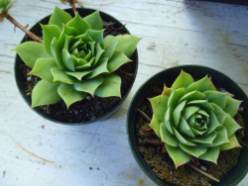 Many of Sempervivum grown from seed are just plain old green rosettes – nicely formed, and healthy, but boring. Did you know you can paint them? Yes, it’s true! Paint them with those acrylic craft paints that you can find in the dollar store for a buck or two. They can be painted to match your bridesmaid dresses and other things in a simple fix. 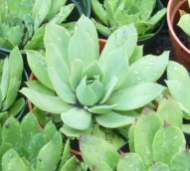 Choose some Sempervivum or other succulents – Sempervivum are my choice, as they withstand rough treatment and fiddling with much better than some of the tender succulents like Echeveria which will lose leaves if you just look at them wrong and paint them in your choice of colours. I used a paint brush with the acrylic craft paints almost full strength will only a little water to dilute it. If you have lots of succulents to paint, I suggest using a trigger sprayer – this would mean you have to dilute the paint a lot so it will come through the nozzle, and it will need two coats to completely cover it. 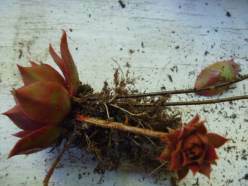 You can attach the Sempervivum rosettes to a bouquet or boutonnière easily with a piece of wire threaded through the center and bound with florists tape, which looks a bit like masking tape but narrower, and stretchy. This will hide the wire, and make it less likely that someone will get stuck with the end of the wire. Add some Paxistima or other greens to a cluster of Sempervivum, and your succulent wedding is well on its way. The added bonus? 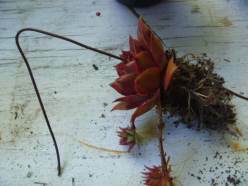 Afterwards, the Sempervivum can be dismantled from the wire and the tape, and stuck in the ground they’ll root and grow again quite happily. You can also make your succulent wedding bouquet with these, using a Styrofoam form to stick the ends into. Make sure that it doesn’t end up too heavy, as there is nothing more guaranteed to tire a bride on her wedding day than an oppressive bouquet – keep in mind that most succulent plants weigh a lot due to the water they store inside their leaves. For a simple and cost effective succulent wedding, try these ideas for using some of the cheaper succulents you can find. Don’t spend a ton of money on your succulent wedding flowers; use the hens and chicks from your garden, painted for the occasion. 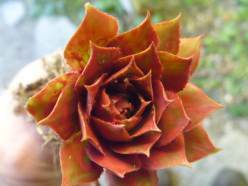 See more about how to prepare Sempervivum for wedding flowers.